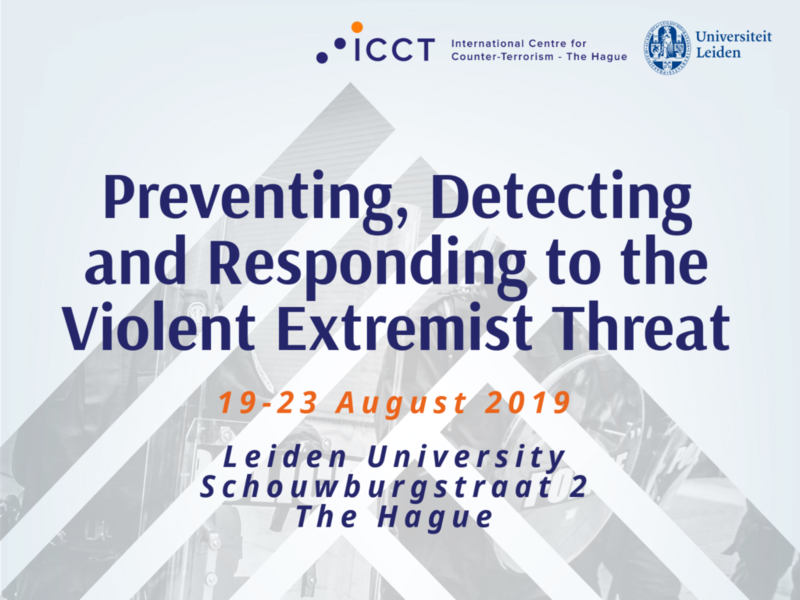 Register now for the Advanced Summer Programme: Preventing, Detecting and Responding to the Violent Extremist Threat organised by ICCT and Leiden University from 19 August to the 23 August 2019 in The Hague. This advanced summer programme focuses on the field of preventing, detecting and responding to violent extremism and gives you insights in the opportunities and challenges of a networked approach. This advanced summer programme, organised by Leiden University and the International Centre for Counter-Terrorism – The Hague (ICCT). In an intensive five-day course, participants will meet academics, experts and practitioners and discuss the latest dilemmas and trends in the field of preventing violent extremism various views on radicalisation, de-radicalisation and re-socialisation, geopolitical developments and how they influence public debate, the opportunities and challenges of a networked approach, the various roles and, perspectives of stakeholders active in the field, are all covered in this programme through lectures, workshops, serious games, panel discussions and much more. Preventing, detecting and responding to violent extremism are ‘wicked problems’ – a dynamic tangle of complex issues, a wide range of stakeholders and no clean-cut, obvious solutions. Tackling this problem requires a networked approach where all actors work together in a joint and coordinated effort. From security services, policy makers, lawyers and academics to youth workers, teachers, parents and other actors, all stakeholders have their own role to play. Each stakeholder, in turn, works from the premise of their own specific perspectives, authorities, interests and limitations. In order to ensure effective prevention measures, strengthen public resilience and increase on-time signaling and addressing of radicalisation, it is vital to understand the position and role of network partners. Expanded one’s network of international experts in the field of preventing violent extremism. PhD students are eligible for a special discount possibility. Please contact us at learning@fgga.leidenuniv.nl if you are interested in the summer programme 2019. The Early Bird Fee is €1395 and applies to the first 10 participants until 30 March, so sign up now! Following this summer programme, participants have the opportunity to enroll in a complementary summer programme that focuses on the legal aspects of countering terrorism, organised by the T.M.C. Asser Instituut and ICCT. Participants can register for one or both of the programmes. The early bird fee for the first five professionals to attend both summer programmes is €2595. The standard fee for entering both summer courses is €2790,-. Should you wish to register for the combined summer programme discount package, please contact learning@fgga.leidenuniv.nl.